This diagram reperesents three stock shapes for Osmun horn mouthpieces. The shaded area is our standard blank. Then green lines show our #2 blank. It adds about twenty percent more mass to the standard blank and has a little more core and stability at the expense (we think) of tone color. The red lines outline our heavy blank, which is fifty percent heavier that the standard one. It is extremely stable and focused but the extra weight makes it more fatiguing to play, especially in the upper register. 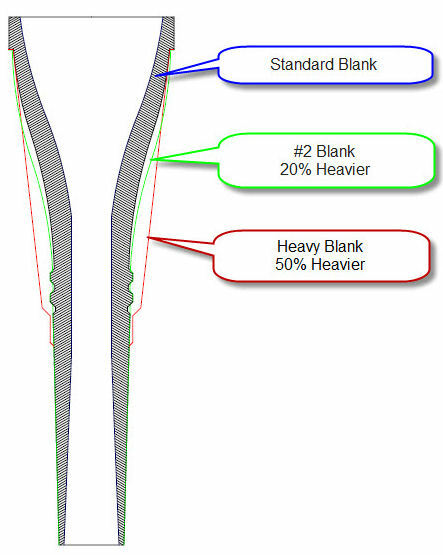 The heavy blank can also be supplied with ribs, which lessens the weight and increases the surface area.